Way back in 2000, cartoonist turned comics theorist Scott McCloud discussed infinite canvas in his book Reinventing Comics. The concept, simply put, is that electronic mediums afford artists an infinite space on which to create their work. Cartoonists should, therefore, take advantage of this new found freedom. Of course, old media companies don't operate that way, and for the past decade or so, the quest has revolved around finding the most ideal way to repurpose existing comics formats for new devices. The clunky interaction and relative lack of portability made PCs less than ideal methods for this consumption. On the flip side, smartphones are just too small for anything but a panel-by-panel reading. Devoted e-readers, meanwhile, didn't do much better, thanks to slow rendering grayscale e-ink screens. The iPad hit the sweet spot, with its portable form factor and large, vivid display. The charge was led by Comixology, through its devoted app and market and apps designed for the industry's largest publishers, Marvel and DC. Reading comics on a device was finally easy enough to convince many physical media devotees make the leap to the digital realm. There are still some roadblocks, however: for one thing, there's that whole $500 starting price. If your primary objective in picking up a tablet is reading comics, that's certainly enough to dissuade all but the richiest of riches. 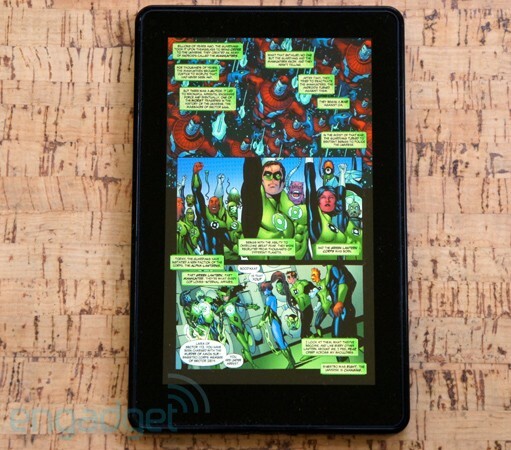 Comics on the Kindle Fire and Nook Tablet hands-on (video) originally appeared on Engadget on Mon, 14 Nov 2011 16:08:00 EDT. Please see our terms for use of feeds.